The Global Volcanism Program has no activity reports for Natib. The Global Volcanism Program has no Weekly Reports available for Natib. The Global Volcanism Program has no Bulletin Reports available for Natib. The massive stratovolcano of Mount Natib, at the northern end of the Bataan Peninsula, is truncated by a 6 x 7 km caldera. The latest dated eruptive products are 69,000 +/- 27,000 years old (Ebasco Services 1977), but sampling is not in sufficient detail to determine the date of the latest eruptions. 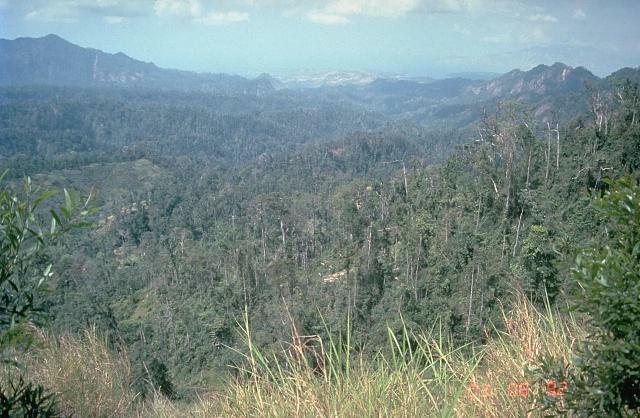 Ruaya and Panem (1991) listed the age of the dominantly andesitic volcano as late Pliocene to Pleistocene, but gave a probable age of the latest activity as Holocene to upper Pleistocene. Five thermal areas are present in the summit region. Defant M J, Maury R C, Ripley E M, Feigenson M D, Jacques D, 1991. An example of island-arc petrogenesis: geochemistry and petrology of the southern Luzon arc, Philippines. J Petr, 32: 455-500. Ebasco Services, 1977. Preliminary safety analysis report, Philippine Nuclear Power Plant #1. Philippine Atomic Energy Comm Open-File Rpt and response to questions. Ruaya J R, Panem C C, 1991. Mt. Natib, Philippines: a geochemical model of a caldera-hosted geothermal system. J. Volcanol. Geotherm. Res., 45: 255-265. Wolfe J A, Self S, 1983. 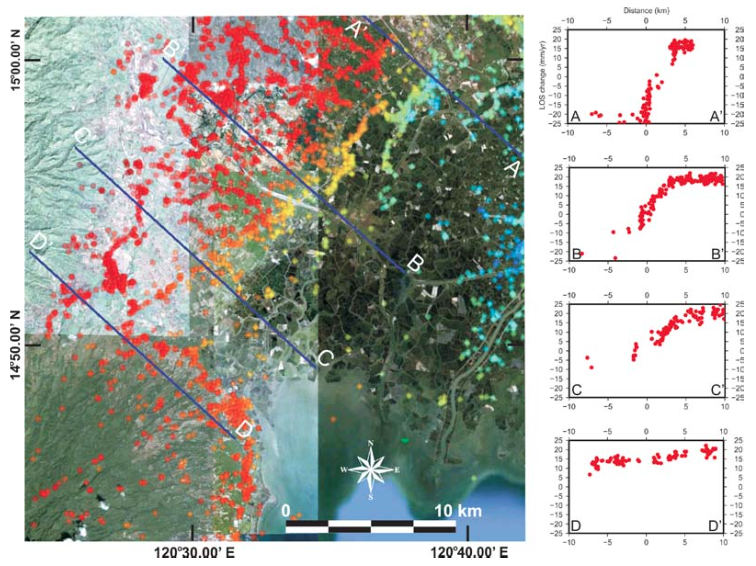 Structural lineaments and Neogene volcanism in southwestern Luzon. In: Hayes D E (ed) The Tectonic and Geological Evolution of Southeast Asian Seas and Islands: Part 2, Amer Geophys Union Monograph 27. The Global Volcanism Program is not aware of any Holocene eruptions from Natib. If this volcano has had large eruptions (VEI >= 4) prior to 10,000 years ago, information might be found on the Natib page in the LaMEVE (Large Magnitude Explosive Volcanic Eruptions) database, a part of the Volcano Global Risk Identification and Analysis Project (VOGRIPA). Remarks: PS-InSAR shows aseismic movement across the Lubao Fault, near Mount Natib, but no volcanic deformation. Persistent scatterer interferometery of the NW flank of Mount Natib and the Lubao Fault. A notable change in line-of-sight (LOS) of the radar signal occurs at the boundary of the fault indicating differential movement of the western block relative to the eastern block. Transect A ? A0 shows the most abrupt change in LOS across the Lubao Fault. The Y-axis corresponds to the change in LOS from March 2003 to March 2006. The centre of the X-axis in the cross-section is the approximate location of the Lubao Fault trace. From: Lagmay et al. 2012. Reference List: Lagmay et al. 2012. Lagmay, A. M. F., R. Rodolfo, H. Cabria, J. Soria, P. Zamora, C. Abon, C. Lit, M. R. T. Lapus, E. Paguican, M. G. Bato, G. Tiu, E. Obille, N. E. Pellejera, P. C. Francisco, R. N. Eco, and J. Aviso, 2012. 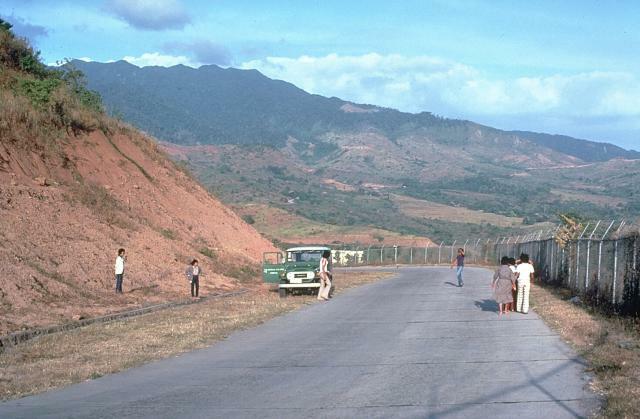 Geological hazards of SW Natib volcano, site of the Bataan nuclea power plant, the Philippines. in Natural Hazards in the Asia-Pacific Region: Recent advances and emerging concepts, Eds. J. P. Terry and J. Goff, Geological Society, London, Special Publications, 361, p. 151-169. There is no Emissions History data available for Natib. The summit of Mount Natib, a large stratovolcano south of Pinatubo volcano, is cut by a 6 x 7 km caldera. This view from the NE caldera rim looks across the caldera to its open side. Five thermal areas are found in the summit region. Mount Natib is a massive stratovolcano at the northern end of the Bataan Peninsula, south of Pinatubo volcano. The summit of the volcano, seen here from the WNW, is truncated by a 6 x 7 km caldera. The age of the latest eruption is not known, but is considered to be late Pleistocene or Holocene. Five thermal areas are found in the summit region. There are no samples for Natib in the Smithsonian's NMNH Department of Mineral Sciences Rock and Ore collection. Large Eruptions of Natib Information about large Quaternary eruptions (VEI >= 4) is cataloged in the Large Magnitude Explosive Volcanic Eruptions (LaMEVE) database of the Volcano Global Risk Identification and Analysis Project (VOGRIPA).